Learn Chess The Right Way 3. Type: BOOKS. Detail: Susan Polgar. Product Code: 9781941270493. A puzzle book with 500 positions on how to defend. In Volume 3, you will be introduced to 500 must know defensive techniques. Each chapter will start with a few introductory examples and explanation about to what to look for in the puzzles that follow. In chapter 1, the task is to move an attacked piece. In each puzzle, there is only one good solution by moving the attacked piece to a safe square. In chapter 2, one of the kings is in check. The goal is to find the correct response. In chapter 3, a piece is attacked, but has no good square to which to move. So, rather than moving the attacked piece(s), you will need to look for a way to protect it with another piece. In chapter 4, we focus on defensive ideas against a direct checkmate threat. In chapter 5, one side defends by counterattacking. In chapters 6 and 7, you will be introduced to the gamesaving techniques of drawing by stalemate or perpetual check. In chapter 8, the task is to catch a pawn that is about to promote. In chapter 9, a certain piece is about to get trapped. The task is to prepare for the attack and avoid material loss. Finally, in chapter 10, you can practice solving a variety of defensive ideas, with the goal to avoid or minimize material losses or being checkmated. 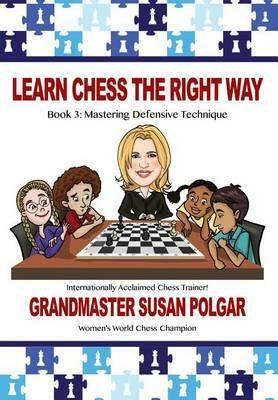 With over 40 years of experience as a worldclass player and coach, international grandmaster Susan Polgar has developed the most effective way to help young players and beginners Learn Chess the Right Way. Let her show you the way to understanding the most common and critical patterns and let her show you the way to becoming a better player. Softback, 168 pages. Learn Chess The Right Way 2. Susan Polg. $24.95.